SPICE is a very reliable piece of software, but it does have its little quirks that take some getting used to. By "quirk" I mean a demand placed upon the user to write the source file in a particular way in order for it to work without giving error messages. I do not mean any kind of fault with SPICE which would produce erroneous or misleading results: that would be more properly referred to as a "bug." Speaking of bugs, SPICE has a few of them as well. Some (or all) of these quirks may be unique to SPICE version 2g6, which is the only version I've used extensively. They may have been fixed in later versions. SPICE demands that the source file begin with something other than the first "card" in the circuit description "deck." This first character in the source file can be a linefeed, title line, or a comment: there just has to be something there before the first component-specifying line of the file. If not, SPICE will refuse to do an analysis at all, claiming that there is a serious error (such as improper node connections) in the "deck." SPICE demands that the .end line at the end of the source file not be terminated with a linefeed or carriage return character. In other words, when you finish typing ".end" you should not hit the [Enter] key on your keyboard. The cursor on your text editor should stop immediately to the right of the "d" after the ".end" and go no further. Failure to heed this quirk will result in a "missing .end card" error message at the end of the analysis output. The actual circuit analysis is not affected by this error, so I normally ignore the message. However, if you're looking to receive a "perfect" output, you must pay heed to this idiosyncrasy. You are given much freedom in numbering circuit nodes, but you must have a node 0 somewhere in your netlist in order for SPICE to work. Node 0 is the default node for circuit ground, and it is the point of reference for all voltages specified at single node locations. In this analysis, there is a DC voltage of 15 volts between node 1 and ground (node 0), and a DC voltage of 0.6522 volts between node 2 and ground (node 0). 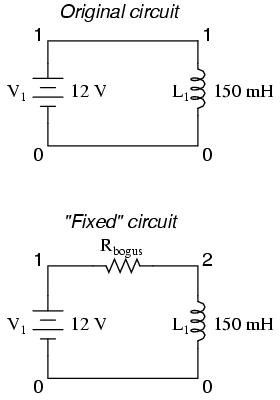 In both these cases, the voltage polarity is negative at node 0 with reference to the other node (in other words, both nodes 1 and 2 are positive with respect to node 0). SPICE cannot handle open circuits of any kind. If your netlist specifies a circuit with an open voltage source, for example, SPICE will refuse to perform an analysis. A prime example of this type of error is found when "connecting" a voltage source to the input of a voltage-dependent source (used to simulate an operational amplifier). SPICE needs to see a complete path for current, so I usually tie a high-value resistor (call it rbogus!) 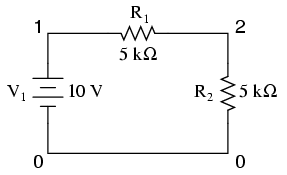 across the voltage source to act as a minimal load. The reason SPICE can't handle these conditions stems from the way it performs DC analysis: by treating all inductors as shorts and all capacitors as opens. Since short-circuits (0 Ω) and open circuits (infinite resistance) either contain or generate mathematical infinitudes, a computer simply cannot deal with them, and so SPICE will discontinue analysis if any of these conditions occur. 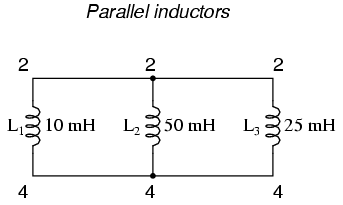 To fix the parallel inductor problem, insert a very low-value resistor in series with each offending inductor. 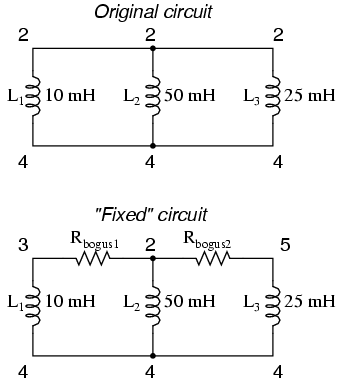 The extremely low-resistance resistors Rbogus1 and Rbogus2 (each one with a mere 1 pico-ohm of resistance) "break up" the direct parallel connections that existed between L1, L2, and L3. It is important to choose very low resistances here so that circuit operation is not substantially impacted by the "fix." 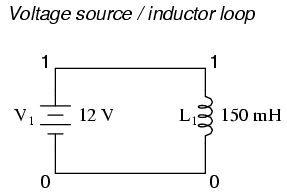 To fix the voltage source / inductor loop, insert a very low-value resistor in series with the two components. As in the previous example with parallel inductors, it is important to make the correction resistor (Rbogus) very low in resistance, so as to not substantially impact circuit operation. To fix the series capacitor circuit, one of the capacitors must have a resistor shunting across it. 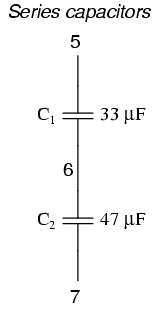 SPICE requires a DC current path to each capacitor for analysis. The Rbogus value of 9 Tera-ohms provides a DC current path to C1 (and around C2) without substantially impacting the circuit's operation. Inserting a "bogus" DC voltage source of zero volts doesn't affect circuit operation at all, yet it provides a convenient place for SPICE to take a current measurement. Interestingly enough, it doesn't matter that Vbogus is a DC source when we're looking to measure AC current! The fact that SPICE will output an AC current reading is determined by the "ac" specification in the .print card and nothing more. 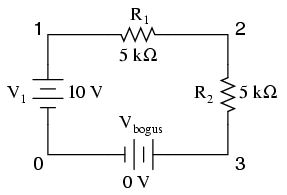 Notice how Vbogus is positioned so that the circuit current will enter its positive side (node 3) and exit its negative side (node 0). 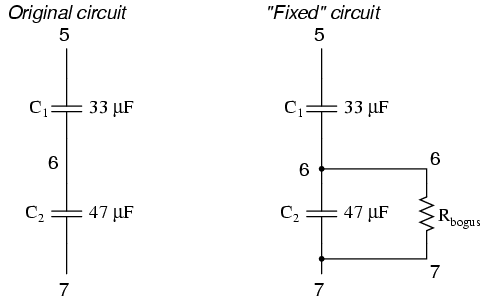 This orientation will ensure a positive output figure for circuit current. When performing a Fourier (frequency-domain) analysis on a waveform, I have found it necessary to either print or plot the waveform using the .print or .plot cards, respectively. If you don't print or plot it, SPICE will pause for a moment during analysis and then abort the job after outputting the "initial transient solution." Also, when analyzing a square wave produced by the "pulse" source function, you must give the waveform some finite rise and fall time, or else the Fourier analysis results will be incorrect. For some reason, a perfect square wave with zero rise/fall time produces significant levels of even harmonics according to SPICE's Fourier analysis option, which is not true for real square waves.